I have been into a funk lately in terms of science fiction books but a single blurb sold me on Sun of Suns by Karl Schroeder. “Mix in one part thrilling action, one part screaming cool steampunk tech, and one part worldbuilding and you’ve got Sun of Suns.” That blurb was by Cory Coctorow another writer I have really been liking. Combining steampunk style tech with a rollicking adventure story while never forgetting the science it was built on is a formula for a good tale. Definite reccomendation. 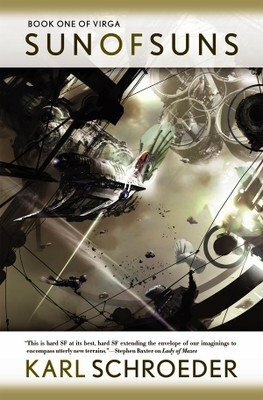 This is where a lot of the recent sci-fi books have been lacking. Scientific realism versus adventure. Too many writers seem to view their books as movie scripts and ignore the exposition that makes it a book, not a script. Schroeder strikes an excellent ballance between the adventure and exposition and the story flows along.